Lock them up and away. Keep medicines and toxic products, such as cleaning solutions and detergent pods, in their original packaging where children can’t see or get them. Great advice! While we all have seen a warning like this, do we ever really think about how it relates to our daily lives? Or, do we just bleep over the words, and do what is convenient for us when the time comes? That’s a dangerous oversight, my friends. True, some accidents are going to happen, but many are totally preventable. It simply requires some pre-planning on our part and to be present in the moment, especially when we are working with household products and chemicals. Although this seems to be common sense, it is surprising how often poisonings happen as a result of container transfer. People move chemicals from their original container into a different container, often a food or beverage container, for many different reasons. You buy window cleaner and wet-jet mop liquid in bulk to save money, and then transfer them into small water bottles with the pull-out/push-in top. These are smaller and more manageable to throw under the kitchen sink, and if you leave them out, at least they are a little bit pretty. A friend gives you a batch of her home-made, never-fail, ant killer that she whips up using peanut butter, jelly, and boric acid – in a peanut butter jar. You mixed up too much plant fertilizer – you know, the kind that turns the water a nice shade of blue – and you don’t want it to go to waste. So you grab an empty gallon milk jug, rinse it out, and pour it in. You want to “borrow” some special cleaner from work, so you pour it into a soda bottle to take home, and set it on the countertop, hoping to get a minute to put it away. You used a nice, yellow tiki torch oil that smells like lemons for the family barbeque. There are only a few ounces left, so you pour it into a Gatorade bottle, and ask your 5 year old to take it in the house. “Chemicals in the wrong container“ are very common calls to poison centers. These stories should make you wince, because you know what’s coming next. We don’t even have to tell you how some unsuspecting family member, or even you, yourself, in a distracted moment, assumed that what was in the container was something good to eat or drink. 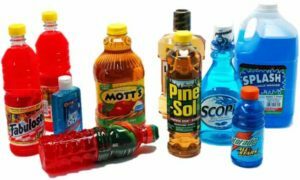 What happens when someone drinks cleaners or other chemicals stored in the wrong container may be “nothing much” – maybe just a bad taste, sore throat, and vomiting; or it might mean a trip to the emergency room with bleeding from the stomach, coma, and fluid in the lungs. Why would you possibly take a chance like that? ALWAYS keep things to eat and drink in a completely differnt area of the home than where you keep chemicals and cleaning products. NEVER, EVER transfer or store a chemical into a FOOD OR BEVERAGE container. NEVER. No excuses. If you do that, bad on you. Buy child-resistant containers whenever possible. Avoid food-scented products, if possible, because they increase the risk of an unintentional ingestion. Right now, go round up all of the products and make sure they are stored out of sight and reach of children, preferably in a locked closet.